To Celebrate 50 years of Revell (and I think it is Revell AG not Revell USA), Revell of Germany has produced several kits that were popular in the 1950s, including some that haven't seen the shelves in decades. As I'm sure you all know by now, what passed for a detailed kit in 1956 is a far cry from what we expect nowadays. Of course, we also didn't have to spend $195.00 to get it as most of these kits sold for a dollar or two, but the market was larger and the kits were all designed to fit into standard boxes. In this way, we get a wide variety of scales. We also get some rather interesting developments when it comes to these models. Many of these were designed to be shown in flight on a stand so no landing gear was supplied. Revell's B-29 and B-36 and B-47 and three that come to mind with this feature. Their ship kits were made to 'sail' on a carpet or wood floor so many of their surface ships have wide, flat bottoms. Also makes them most handy for the stormy seas of the bathtub ocean. I know that many of my old Revell ship kits were sunk and raised several times during a session. None so treacherous as the Sudsy Sea! So what we have in this set are three old favorites, boxed in honor of an ABC TV show that I don't remember called "Navy Log". In with this set are the 1/305 USS Nautilus, 1/480 USS Boston, and 1/424 Seaplane Tender Currituck. All this is in a most authentic looking box top straight from 1956 with the old number, old price and everything that looks just like it did when we were kids. At a hefty price tag of $4.95, I'm sure that few were bought and when they were, they were for special occasions like Christmas or a birthday. I had thought about showing all the sprues, but to be honest, I doubt if anyone really cares. These are old kits with the sprue runners that are not nice and rectangular as they are today and it would be a mess to spread everything out. Besides, typical of older kits, many of the parts have departed the trees. What I will tell you about these kits is that there has been quite a bit of care taken with the molds. I found almost no flash and the level of detail is pretty well what you'd have found in 1954/56 if you'd bought the kits new. I was quite surprised at this as I'm used to seeing flashy and poorly molded reissues of these older kits. Another note on the boxes. While the tops are authentic, the bottom has all the copyright dates to show it is a 2006 release. Another is that the box top is designed to fold on the corners. I don't believe the old Revell boxes were so designed. It is pretty cool to look along the box sides at all the other neat Revell kits that one could get. I can only hope that Revell of Germany decides to release some of the other goodies like the Airpower set or the Missile set. The kit instructions have been combined into several sheet so you don't get three separate sets of instructions. The Instructions are copies of the older ones and while the paper isn't the same, they are not just cheap photocopies and are quite easy to read. They are complete reproductions down to the parts list and the little coupon you'd send in if missing a part. Apparently there was a glitch with the original instructions for the Boston as a separate set of instructions for this kit with different part numbers is supplied. 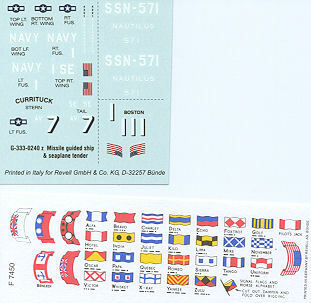 You get one sheet with decals for all three ships and two paper flag sheets (one is shown). Paint is all generic as I don't think the FS 595 system existed in the 1950s. While I don't doubt that there are some who have the skills to turn these into beauties, most of us will either stash them away for 'later', or will build them as they came from the box. I know that things like this sell mostly on nostalgia, and I'm glad that they are not hugely expensive. In fact, if you think about it, it comes to $10 a kit, a bargain in today's market no matter how you look at it. Thanks to me and my wallet (plus a dose of nostalgia) for providing this kit for preview.